Okay, I think I maybe am going to go insane! But insane in a good way. I think. Just as I was getting into my apricot groove... a family friend invited us over to pick plums from her tree. Her tree is aching under the weight of heavy ripe fruit. This tree is huge, and has branches and branches and branches of plums. Guess who is the proud owner of a ton of plums? And so, faced with a huge box of apricots ripening as I watched them, and two big bags of plums threatening to turn to plum substance, I had to act fast. Good grief. The cherries on the counter turned into apricots and the apricots on the counter turned into plums. At some point, I would be curious to see if I remember what the counter looks like! I'm not complaining, really I'm not. I'm very very happy and counting my blessings to have so much fresh fruit coming my way. It just comes so fast. The apricots are fabulous because they are so easy to work with, but they are limited, too. They are too soft to bake with... they just turn to mush. As I already had apricot syrup and apricot jam, I was looking for something different. Different and easy enough to take care of half of a box right quick, that is. So, I took the rest of the apricots, and canned them. This was the first time I ever canned something whole... usually I turn it into jam or sauce or syrup and then can that. As it turns out, canning whole foods is super duper easy! I love it! This is considered "cold pack" canning... where the fruit is "cold" (as in not cooked). 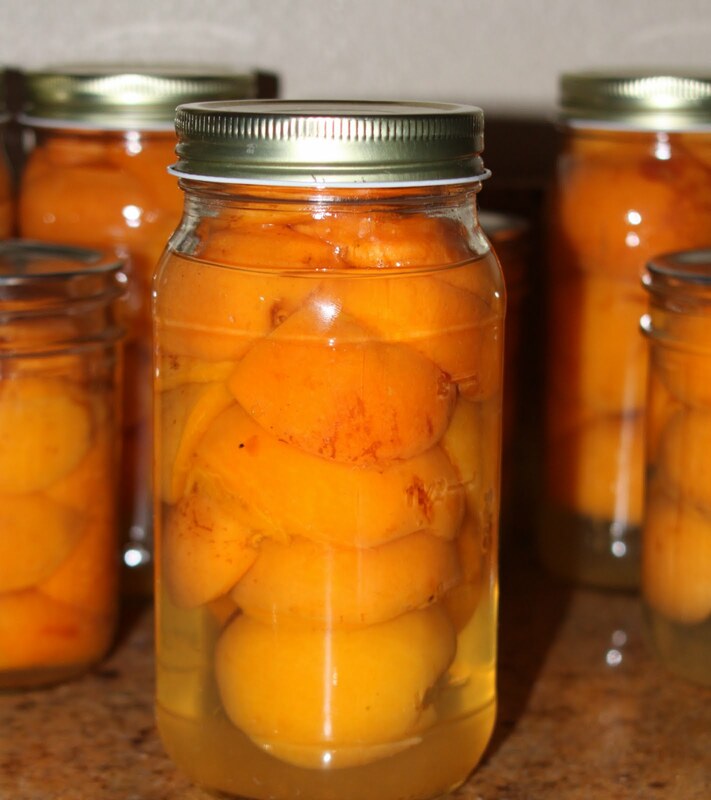 All of the good qualities of apricots make them perfect for canning. You don't have to peel them; you just cut them in half, twist the two halves in opposition to each other, pop out the pit, and move on. If you ever wanted an easy way to try canning, this is it. I promise. All you need is the apricots, sugar and water, some jars, and a big pot. First, make your syrup. This can be light syrup (1 part sugar to every 2 parts water) or heavy syrup (equal sugar and water) or somewhere in between. Combine the sugar and water in a pot, and heat until the sugar dissolves. Next, fill the jars with apricots. Cut them open, remove the pit, and place them into the jars. You can fit the most if you put them all in cut side down. As soon as you fill a jar with apricots, fill it up with the syrup. Leave about 1/2" headspace at the top. Put the lid on, and screw on the band fingertip tight. Continue until all of the jars are filled with fruit and syrup. Place the filled jars into the pot of water, and boil for 25 minutes (increasing as needed for elevation... 5 minutes more if you are at 1,000-3,000 feet). Voila! The fruit that was about to be lost forever is now safely preserved and ready to be eaten at your leisure for months to come. Phew! And... you guessed it. Lots of plum recipes coming soon!